As you may have seen from our last Gulf Tides video, some of the money from BP fines will pay to build land using the Mississippi River. Restoring the river to the delta is the "lynchpin" of Louisiana's Coastal Restoration program, as embodied in the Coastal Master Plan. The patient, the louisiana coast, is critical. The treatment is not simple. There are many uncertainties, and there are many factors to monitor and adapt to, as a recent scientific panel concluded. There are steps the often-negligent state of Louisiana could take to regulate pollution and to ensure that the restoration works most effectively. But the oldest evidence that restoring the river will work are the Wax Lake Outlet and Atchafalaya River Deltas--which combine the restoration of the river with the beneficial placement of dredge material ("BUDM"). There's a new way to look at these areas, the only deltas in Louisiana consistently building wetlands by gravity, as nature has for thousands of years. 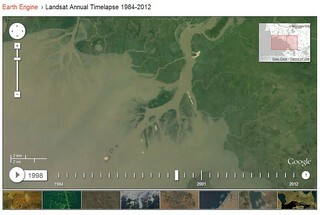 Google has recently released animation of satellite photos that show many landscape changes. It has been fascinating to look at Louisiana's Coast with this Earth Engine. What's fascinating about this new imaging tool is that it allows us to watch how the river and the dredge can work together to build land. It's apparent, from this animation, that not only is the river building land, but that the flashes of white from dredged material, especially in the Atchafalaya, are supplementing the river's work. This is the combined plan for project at Myrtle Grove to restore the wetlands destroyed by the Lafitte oil field-- to restore the river and to use dredged material. Watch Port Fourchon expand as the Timbalier Islands roll back to shore, and Elmer's Island erodes. Watch the Birdfoot Delta form new barrier islands as the river backs up from Sea Level Rise. Watch the first marshes appear in the Myrtle Grove project area --marshes built with the use of a dredge (center of photo, starting in 2010).